I finally understand why Captain America is the natural leader of The Avengers. Cap can lead The Avengers because he embodies the integration of the Marvel Cinematic Universe in his films. The first Captain America introduces the cosmic cube — which factors directly into The Avengers, after being “rediscovered” by Howard Stark. It also factors into a long form narrative the MCU is interested in telling, that of Thanos and the Infinity Gauntlet (or at least they want us to deduce as much). It also introduces us to HYDRA, which prominently figures into The Winter Soldier and as a major development with SHIELD. Similarly in The Avengers, Cap arguably has little to distract him from the mission, unlike the other Avengers. (Side note: IN FACT, he goes off book to investigate what SHIELD is up to, now obvious foreshadowing for The Winter Soldier.) Tony Stark is caught up in his individualistic tendencies, not being on board with the Avengers Initiative, and Pepper. Bruce Banner must be wary at all times of his capabilities as The Hulk and is used by SHIELD and Loki under false pretenses. Thor is enmeshed in the mission as well as dealing with his brother’s involvement. When we get to The Winter Soldier, yet again, it moves the most plot –overall–of any of the films that came before it. It’s interesting how each individual superhero arc is used in the MCU. Either they are contained by their own storyline or they have a flexible structure that can take on the big overarching narrative. A successful Marvel film, at this point in the game, is to advance character and/or to advance plot. In theory, a film should do both but you can see different preferences throughout the MCU. Obviously, some stories aren’t shaped by preference but by accessibility; it is hard to take on the grand MCU narrative in a Thor film, where so much of the action is contained in Asgard and other realms. Iron Man 3 focuses on the advancement of Tony Stark as a character and succeeds at delivering that as well as a carefully crafted, contained narrative. The Winter Soldier focuses on tearing down the governmental world the MCU has been building since Iron Man. 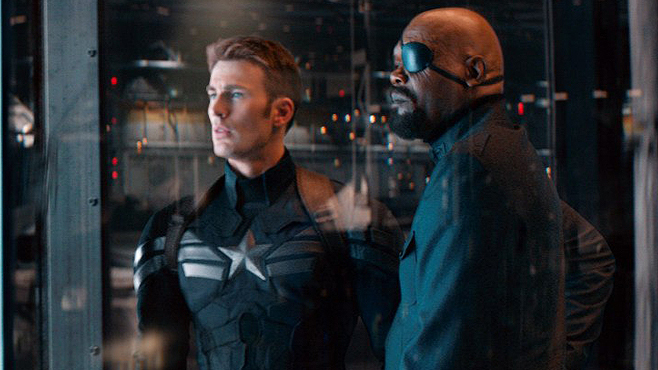 The film strengthens and deepens Cap’s character by forcing him to confront his past via a myriad of ways, but this is the character development, cherry on top of the complete dismantling of SHIELD. Finally, how could you not watch this without thinking about “Marvel’s Agents of SHIELD” (unless, of course, you don’t watch it)? The filmmakers and show runners made it clear that the series has knowingly built towards the events of the film all season. So the series was effectively spinning its wheels all season, waiting for The Winter Soldier to change the game. In hindsight this all seems so risky. Marvel masterminded a continuation of the MCU onto the smaller screen, and wanted the show to be shaken up by The Winter Soldier by the end. While this might sound good in the writer’s room, they must have overestimated how interested fans would be during the wheel spinning phase. The series is now poised to embrace the shake-up caused by The Winter Soldier, but will viewers come back or will “Agents of SHIELD” be the first casualty in Marvel’s fast growing, far reaching universe?